The name Chisinau comes from Romanian word "chisla noua" which reffers to a spring on the corner of Pushkin and Albisoara streets around which the original city was built. Chisinau has its own emblem and flag which has been changed several times . Today's emblem was designed after Bessarabia was joined to Romania. It represents escutcheon with a golden eagle on an azure background. The eagle has an emblem on its breast containing the head of a bull, a star, a rose and a half-moon symbols of the Moldovan pricipality. This emblem was restored after the dissolution of the USSR. The modern flag of Chisinau is white with the emblem of the city situated in the center. The emblem is laid over a semiabstract branch of white and brown flowers. Nowadays the population of Chisinau is more than 700 000 inhabitants. However it was much less. Chisinau was rather a village than a city. In 1774 the population of Chisinau amounted just 600 inhabitants. Since that times population of Chisinau constantly grew up till the USSR dissolution. Since the USSR dissolution the population of Chisinau started to decrease. However anyway today Chisinau is the largest city in Moldova in terms of number of inhabitants. As the population grew the city also grew in its territory and in a certain time there appeared need to divide city in sectors. Nowadays Chisinau is divided into 5 sectors: Centru (translated from Romanian as "center"; this is the oldest part of the city), Riscani, Botanica, Ciocana and Buiucani. For the first time Chisinau was mentioned in historical documents on 17 July 1436. It got status of a city in 1818 soon after becoming a part of Russian Empire. Chisinau became a capital city in 1940 when there was established Moldavian Soviet Socialistic Republic. After USSR dissolution Chisinau was declared to be the capital city of Moldova and it is the capital city till nowadays. Chisinau changed a lot since its establishment. There was no need at the beginning in transport as the populations was quite small. However then appear trams, then the trams were pushed out by trolleybuses. Now there are several means of public transport in Chisnau: buses, trolleybuses and jitneys. Taxis are widely spread in the capital of Moldova. On our site you may read more about transport in Chisinau. Chisinau is connected to other localities in Moldova and also to other countries. The connection with other localities is accomplished mostly by buses. However there's also train connection. To others countries Chisinau is connected by airplanes, trains and buses. You may find Moldova train schedule on our site. There are many places for tourists to see in Chisinau (monuments, museums, parks). Many hotels in Chisinau are welcoming every visitor. So, come to one of the greenest cities in Europe and see it with your own eyes. 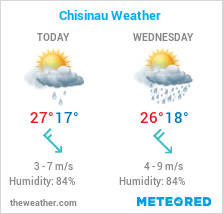 If you want to see the city right now but can't do that browse our photo gallery of Chisinau.